Entire male cats don’t make great pets in general. They are very territorial, fight a lot and really want to breed. What are your options if your male cat is biting you? Can you do anything other than castrate them? My next question is from Akila in India and he has a four-year-old entire male cat who is very anxious, stressed, and has had behavioral problems for the past two years and he’s just getting really aggressive. So the cat has bitten his dad for four or five times, bitten his mom a couple of times and he just doesn't know what to do. So they're actually keeping the cat outside on a tether so that he can't attack anybody because they’re just really worried that he's actually going to attack and bite them. He's getting very anxious if cats are coming into his garden and into his neighborhood. He's outside so he's kind of watching the birds and he's watching the comings and going, but he's getting really stressed whenever he’s let off, he will go and have fights. He's also kind of looking to mate the other cats in the area and they're just wondering what to do. They really love their cat, but he's causing them a lot of stress as well as being under a lot of stress himself and the comment is that he's the angel from hell so things are pretty bad. There's a couple of things that we can do and suggest here, and my first comment is that entire male cats are very territorial and they've got a very high drive to breed. So that I think can explain a lot of the behavioral issues that we're seeing here. So strange cats coming into another cats territory, especially a male entire cats territory is going to be a massive cause of stress and they're going to want to just go and see to those cats, let them know who's the boss and get them away from their area. Being restrained as well, and really not stimulated enough is not going to allow the cat to exhibit the normal marking behavior and other normal behaviors, and that's going to be a form of stress as well. Obviously we can't rule out medical issues causing pain or other issues that are affecting the cat's behavior, and certainly pain is a big cause of aggression in some cats. Cats really want to avoid any causes of pain and they're going to potentially become grumpy or aggressive if they're worried that something is going to hurt. 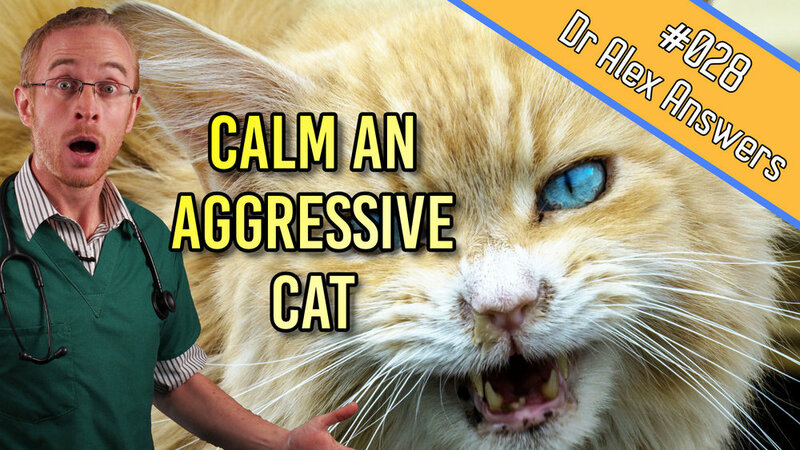 So if you're going up to your cat and they're painful, they're going to either try and run away, they're going to hiss, and they may even lash out if they feel that's their only option. There are a number of things that we can do. I've actually got a guide to stress in cats that you can download for free at ourpetshealth.com/resources, you can find that free guide and that goes through some of the steps that can be taken in general to reduce stress. Now in this case, neutering the cat, castrating the cat is going to be a big contributor and so if we can do that, it's not going to fix it in one go, but it's more than likely going to reduce all of those behaviors that are driven by the hormones. Now there are pheromone treatments as well. So Feliway in cats is fantastic for helping them feel calm, helping them feel like the environment they're in is their home, is their safe space, and so that can reduce stress. Eliminating resource competition and access by other cats is also huge. So if you've got cats coming into the garden, it might be a case of actually just keeping this cat inside for a period of time so that he can get used to being in a situation where there aren't lots of other cats coming in and stressing him out. And then finally mental stimulation is another big thing. So we want to be giving toys, we want to be hiding food or giving food and treat toys so that it takes a little bit of effort, it takes a little bit of thought for them to get a reward. Now it can be quite difficult to play with cats, but that's something to do as well. Food toys, food puzzles and things like that or just spreading out the food in a room and mixing it up within a sheet so the cat has to burrow and find that food can all be a good strategy for helping to stimulate a cat’s brain and take their mind off other things.